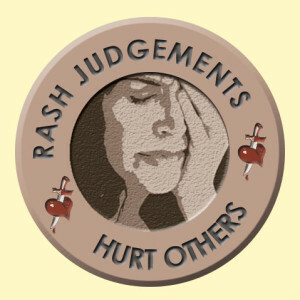 RASH JUDGEMENTS ARE SO INCREDIBLY EASY TO MAKE. How many times a day do we inadvertently make rash judgements? We allow our pride to confuse us, and decide we’ve got it all figured out. We claim that our way is the right way, making all sorts of assumptions, when we really know nothing about others or their situations. When someone looks at us with what appears to be an unfriendly expression on their face, we assume they are either mad at us or they don’t like us—what a ridiculous, rash judgement to make. It’s quite possible that their expression had absolutely nothing to do with us and even if it did, we should pity them for whatever they are going through. We might even go so far as to treat them poorly as a kind of revenge or and create all sorts of rules they must follow because of our sinful judgements of their behavior while justifying our actions as valid. We tend to be very intolerant of others sins, if they offend us, when we have so many of our own sins which we expect others to tolerate. How about when we meet someone. Afterwards, do we spend our time reliving that encounter trying to figure out how and why they reacted to us. Then we declare they like or dislike us or that we dislike or like them based on just a few moments of interaction. Only to come to find out later on, after we get to know them further, our “certain” feelings we had about them were completely wrong. That is judging someone. We shouldn’t spend our time trying to figure out whether we like or dislike someone or whether they like or dislike us. We will gather these opinions naturally without extending our thoughts on the mater and we should work towards trying to figure out how we can love them, perfectly, as God loves them whether or not they displayed expressions of like or dislike towards us. Truly letting go of our judgeful feelings is hard work since we do it so often. But our thoughts should be that of love, not judgement. We rashly judge others by their appearance, what they say, what they do, etc. Yet, spend almost no time actually getting to know them or what’s going on in their lives. Sadly, sometimes our initial rash judgements will alter our opinions of people to such an extent that we can’t properly see them for who they really are. How many times has someone been harsh with you, and you go ahead and presume from that point on that everything about them is negative, then whenever you see them you feel angry or bitter with them. Only to later—once you’ve gotten over your rash judgements and anger—find out they were not really so bad after all, and were maybe even nice. We shouldn’t look at people’s faults or failures and criticize their imperfections in the first place. This intolerance of others imperfections leads us to many of our prideful unloving emotions and behaviors. We are sinners too (cf. Matthew 7:1). Perhaps we don’t all sin the same sins, but we certainly aren’t free from guilt. We have no right to be angry with others, since we are called to love everyone. “But I say to you that listen, Love your enemies, do good to those who hate you, bless those who curse you, pray for those who abuse you” (Luke 5:26-28). There is no “justifiable anger” with God’s children since we are all sinners. Perhaps we don’t commit the same sins, but truly, we have all sinned and sinned a lot. Some people might say, “Oh, well, I would never do that,” as an excuse to explain their self-righteousness and “acceptable” anger. Who can cast the first stone? Our lack of love—due to our lack of grace—is the cause of our anger, intolerance and unforgiveness of others. All of our actions should be loving—despite the actions of others. We should never try to justify our anger by making excuses for our unloving choices. If we feel anger toward someone, we need to do all we can to develop sincere love for them, as well as understanding and forgiveness, which is accomplished through an examination of conscience, prayer, and repentance (with the desire and actions necessary to change). Someone can treat us wretchedly, yet we are called to love them in return. “Father, forgive them; for they do not know what they are doing” (Luke 23:24). We should pray for them, and pity them for their lack of grace, since someone with enough grace from God responds with love in all circumstances. I’m not only referring to grievous anger, I also mean that all unloving personality traits must be eradicated. For example, things like frustration, annoyance, lack of care for others or their situations, intolerance, lack of understanding, impatience, speaking disrespectfully, being demanding, becoming fed up, unwillingness to suffer, unwillingness to do more to end moral injustices, being self-absorbed, etc. These attitudes are not reflections of grace—they are the fruits of sin; a lack of love. They are sinful and stem from anger and selfishness. Are they mortal sins? Most likely not, but they don’t deliver joy and can certainly lead to mortal sin. They prove a lack of grace, and our desperate need for prayer and repentance. What is love? Does love stand by and do nothing when injustices are happening? No. Love will stop what they’re doing to help others, even if they could be disliked in return…and much of the time that desire to help is driven by anger at the sinful choices others have made. The atrocity of abortion should develop a scene of anger that our country finds it acceptable to legally murder it’s unwanted children. However, we should pity the poor souls that perform and participate in such horrific acts of murder — moral injustice– since they lack the grace to know what they are doing, and their sins are destroying their souls and the souls of others. That sin should drive us into anger in our hearts which delivers the desire to participate in the ending of abortion. Therefore, we shouldn’t ever support the sinful choices people make and we should work hard to bring others to the truth. Plus, the heart piercing pain their sins cause us will wound us greatly–that is one of the consequences of sin. However, anger is only justifiable if we feel angry at the grievous sins of others — anger towards sin–not people–while we pray for their repentance. Even with that anger, we must be slow to anger. We should treat others the way we would want to be treated and not deliver unjust punishment for sins. And that anger must be done, out of love, to end injustices since it is our moral responsibility to do so while always pitying those who have sinned. “He who justifies the wicked and he who condemns the righteous are both alike an abomination to the Lord” (Proverbs 17:15). 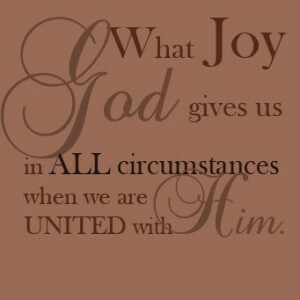 We can be in great anguish over the sins of others. Yet, through God’s grace we shouldn’t be angry with the person committing the offenses, no matter how grievously they behaved. Love the sinner. Hate the sin. Pray for and pity those who hurt you and do evil against you since they lack the grace to live a life of love. “Refrain from anger and forsake wrath. Do not fret—it leads only to evil” (Psalm 37:8). When we forgive, we must forgive instantly and completely. Every moment that we spend holding on to unforgiveness leads our hearts away from peace and into pain and suffering. Truly, Jesus is present in everyone—even the worst of sinners. All of us sin, and some sin more horribly than others. We should feel pity for the sinners who are lost in serious sin, seek out Our Lord’s love and healing when we’re injured, and respond with His love when a person has wounded us or others instead of brewing with anger (unforgiveness) towards them, for if they do not repent of their mortal sins they will surely end up in Hell for all of eternity. Even if they do repent, there will still be tremendous atonement (payment) that needs to be made—as part of God’s justice—for those sins. Anger and judgement is to be left to God alone. When someone grows in much closeness with God, they will notice their anger (lack of love)–those sinful emotions–towards others dissipate since you can’t be united with God, who is love, and be engulfed in anger with unloving personality traits. The impatient, annoyed, frustrated, grumpy, personality they had will be a thing of the past since those are emotions outside of love and outside of the teachings of Christ which are a result of a lack of grace. Therefore, if you notice you are becoming more impatient, annoyed, frustrated, etc. with others, let that be a clear sign that you are falling away from God due to your sins. Those are signs of a lack of Grace. Somewhere in your life you have sinned and fallen from much grace which is resulting in your increased sins. Looking carefully into your life, through prayer, at the choices you have made and where you lacked the grateful, humble, selfless heart of a servant and where you chose to not follow God’s commands, will enlighten you to your failures. With God’s help, through the sacrament of reconciliation, you can rid your life of those offenses and begin to grow in closeness with God again, and those “unloving” behaviors can become a thing of the past. Read examination of conscience for help. When we have the opportunity to form an opinion about someone, we should simply look right past their imperfections (sins) and see Christ who lives in them with patience and love while praying for them. It is hard sometimes to see Jesus since their exterior shell and their actions can be so distracting, from Christ who dwells within them, that all we see are their flaws. No harsh feelings should be present towards anyone since, like I said, anything outside of love is a sin. Of course, we should still use our observation skills. We certainly shouldn’t like the wrong things people do…simply love the person…hate the sin. We don’t even have to like being around everyone. We shouldn’t like being around those who hurt our Lord greatly with their choices. In fact, it would be wise to avoid them since to be pure, we need to do all we can to associate with those who are pure. We can recognize right from wrong and good from bad. That is a grace from God to know and understand His Way. We must realize even though we can see the wrong others do, we simply will never know why it was done. Nor can we claim because someone does something wrong that they are bad. God is in everyone…nobody is bad. We simply do bad things. In order not to form a rash judgement when we first meet someone, we need to remember that what we see is only how they “seem.” He “seems” troubled. She “seems” nice. Try to refrain from deciding anything about their character, as doing so is a rash judgement. Avoid saying, “They “are” nice or he “is” troubled, in regards to people we don’t know. It takes quite some time to really get to know someone, and even with time, only God truly knows anyone. We can say “they did a nice thing” because we can observe right from wrong. But we can’t say we know why they did what they did. They could’ve performed an act of kindness for self-glorification—we simply don’t know, only God does. However, we need to understand that we truly don’t know why anyone does anything, or fully understand their situations, so we are called to love everyone and look for the wonderful works that God is doing in them even if they aren’t done with pure intentions. In trying to discern someone’s character, we can let their fruits guide us to recognize the faithful (cf. Matthew 7:16), but again, we can never truly know “why” anyone does anything. Therefore we simply must never judge anyone. Most of the time we have more than one intention for everything we do—some of them are good intentions while others are bad. For example, my neighbor came home from having surgery in the hospital. Since I want to show love to others and help them when they are in need, I made her dinner and brought her some flowers. But when I looked deep into what my intentions were, I realized I also wanted her to like me and think good of me as a neighbor. Most of my intentions were good, but since I have a sinful nature—as we all do—it’s very hard to truly do anything with pure intentions, as selfishness tends to creep in due to a lack of grace. I was looking for a smile and a thank you, and desired both approval and to be held in high-esteem, because of my pride. Therefore, I didn’t act purely out of love for her since I neglected to fully recognize God—who is in my neighbor—hoping for nothing (no reward or kindness in exchange) but God’s love in return only. 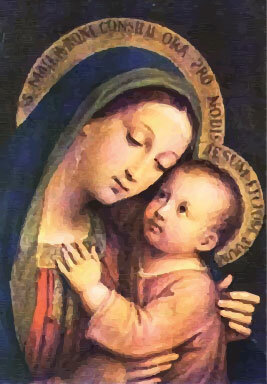 Asking the Blessed Mother to pray for us to Our Lord, so that our thoughts and actions can be pure, to ensure we can see Christ in everyone and focus on Jesus—who we are actually loving in all people—will surely help to clear our minds of the judgement and anger we have towards others. That way, the supernatural love God wants us to have for one another will permeate our lives. Before God consumed my soul with much grace, I committed many rash judgements (Sadly, I still commit them, but on a much reduced scale–praise God). One particular rash judgement still stands out till today. I was at a church for a penance service with my children who were quite young and rather rambunctious at the time, and a particular woman, who was known throughout the church as being quite involved, was not blessed with patience and understanding towards me at my seemingly challenging children. Then she began to boast of her own children and how she would never allow them to behave in such a manner. She stated if I don’t get control of my children, they will grow up a mess and how her children are grown up (doctor and such) and doing wonderfully because of her good parenting. Anyway, I left the church service very upset with this woman declaring her to be a horrible, closed minded, ill tolerant, selfish, person having no understanding for anyone whose children had different personalities than hers. Yes, she rashly judged me but that was just the start of my rash judgements against her. I didn’t see Christ in her or have any understanding for her nor pity for her lack of grace in that situation. I thought her entire person to be lacking in love and tolerance, and how through her arrogance she thought she knew everything. When in reality, I only knew how she responded to my children that one time, in that one event which lasted only 2 mins. Wow, I was a mess, and I chose to inflate my hurt pride by rattling off all sorts of rash judgements about her to justify my parenting. My children, who were exhausted from a long day at school and then had to go to church, weren’t very quiet or willing to obey me. She was right, they weren’t very well behaved. Praise God now, after my great conversion (grew much in faith), God has given me the grace I need to understand her. It is hard to understand others when our life or children behave much differently than what we have experienced. For the most part, my older daughters were very quiet and well behaved children; that was simply their personalities.. I might have thought their obedient behavior was a result of my “good” parenting, but really, they simply had calm demieniors. I’m not saying good parenting doesn’t play a large role in our children’s behavior, it does, but, in my case, two of my sons were simply very active strong willed boys, and if you didn’t know them you might think I was a non-fit parent. That was probably where this woman was coming from. She isn’t evil…she probably simply doesn’t have the grace to understand. Many people don’t have the grace to offer up distractions from children and have patience and tolerance for that situation. But that doesn’t mean their whole person is horrible–they just lack tolerance for children. And since this woman volunteered at the church so often, she might have felt ownership of the church and the need to administer what she felt was necessary discipline. But who really knows, and it really doesn’t matter. I’m called to love her regardless of her intentions or her actions. And I didn’t. After she hurt my feelings, I had the choice to pity her for her lack of patience and tolerance or become angry with her. I had the choice to forgive her immediately or despise her. I had the choice to love her and move on as if nothing had ever happened or brew anger in my heart and leave the church because of her rudeness. And sadly, that is what I did. I was so upset by her remarks and since she was so active in the church and part of the church’s youth program, I decided I never wanted to see her again or take part in a church that had her as a volunteer. So, I chose to leave that church over a two minute confrontation. Never once did I think my line of thinking was sinful in any way. I completely justified my anger. She did me wrong; I did nothing wrong, and I had the right to be angry, I thought. Yikes, I was very much lacking grace. I never even contemplated, if it isn’t love, it is a sin. I was mad and all I wanted to do was put her down in my mind by calling her all sorts of names and I declared her to be completely off the wall wrong. Believe it or not, years went by and still if I saw that woman at church, even though for the most part I attended another Catholic Church, I would still declare, in my mind, that she was the mean, arrogant, obnoxious woman that hates kids. What a horrible person I was! I rashly judged her whole person over a two minute short coming she had. What absurd rash judgements my hurt heart created. I’m sure she forgot completely about the whole incidence from years ago. Yet, I, who was declaring to be so much better a person than she was, was still brewing anger inside towards her for something that happened so long ago that I should have looked at as nothing at all except her lacking some grace. I proved, by my actions, I was far worse a sinner by 100 fold. “Love your enemies, do good to those who hate you, bless those who curse you, pray for those who abuse you” (Luke 6:27-28). I surely wasn’t living those words of God. And I was miserable as a result full of unhappiness whenever I went to the church where this woman was. Now, God, in His great mercy, has forgiven me for my many transgressions and consumed me with much grace, and I can attend the church where this faithful woman still worships and truly see Christ in her and love her knowing her sins of the past are sins just like mine simply different. I have forgotten about her imperfections when I see her, and hopefully, God willing, won’t bat an eye in anger at anyone who would speak poorly to me again. God has tried me on this issue over and over again since His wonderful grace has transformed me and, for the most part, have responded with love and forgiveness instantly. Praise God!